GLS Glacomo now called JAX will get ALL the attention he deserves in his forever home. Andrea, Shelley, Matthew, Carrie and little dogs Oliver and Sugar. 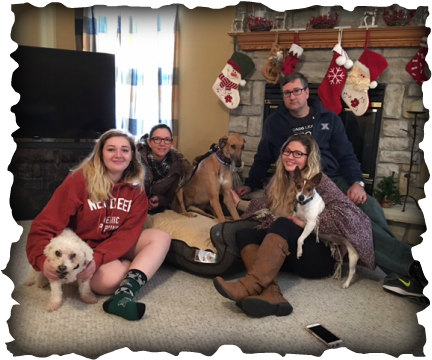 This adoption was a surprise to Carrie and Andrea who are home from college, they couldn't have been happier. Jax was so cute when he met Oliver and Sugar, he turned to run away, his tail was so tucked it disappeared between his legs, he had never seen a little dog before. I'm sure after a couple days they will be good buddies. After exploring the entire house, he found his bed and settled right into this loving home. This is a very lucky boy, he's a bit timid and this family will have the patience and understanding to help him become part of the family.